The method to develop TPACK does not exist until now. 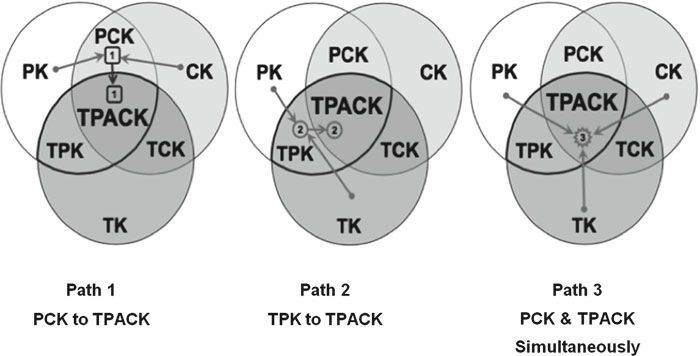 In practice, various methods are used to develop TPACK. The authors of the TPACK model group them into three types of approaches, each with their strengths and weaknesses. This method focuses primarily on identifying the main learning activities within a knowledge domain eg. group discussions, field work, laboratory activities, etc. These structures are very context specific. After the inventory, the ways in which technological applications can support these central activities are explored, based on the relationship between technological characteristics and activities. This approach is focused on the potential of the technologies and technological tools in supporting methods, goals, and evaluation methodologies. By creating a general knowledge base about the educational potential of technologies so that instructors / teachers can apply this knowledge in their own field of expertise. The third approach is the most radical approach. The approach is based on “design teams” of teachers / lecturers who think about the technology component while developing a learning environment / a lesson.